About the Author: Efrain Rios is the founder of Fortress Oil & Gas, LLC, an asset integrity consulting company specializing in records and data management. Over the past 15 years, he has specialized in the development, standardization, and implementation of asset integrity data management software applications. As a former UltraPIPE consultant and trainer he developed critical software functionality and led large scale database restoration projects to improve customers’ data quality and reliability. For nearly a decade he managed BP’s mechanical integrity data, systems, and processes, including the development and implementation of a paperless inspection program for the largest UltraPIPE database in the world. He later led a global community of practice with over 50 members in 12 countries, embedding best practices into standardized daily operations. He recently served as the Director of Asset Integrity for a Houston-based pipeline services company and he continues to be a leading member of the UltraPIPE Users Group Committee. An IDMS is a software application used to manage inspection results and schedules for fixed equipment such as pipework, heat exchangers, pressure vessels, and storage tanks. They also provide access to certain asset integrity records that companies are required to maintain for the life of their equipment. Per inspection codes API 510 (pressure vessels), API 570 (piping), and API 653 (storage tanks), inspection results must be analyzed to assess the equipment’s integrity and determine whether (a) it’s suitable to remain in operation until the next scheduled inspection date without intervention or (b) its integrity has been compromised and requires some form of remediation, e.g. repair, alteration, re-rate, or replacement. The software assists in these assessments by calculating equipment corrosion rates, remaining lives, next inspection dates, and retirement dates based on stored thickness data from previous inspections. It is also common for an IDMS to store other pertinent information such as design temperatures and pressures, materials and codes of construction, installation dates, insulation types, and scaffolding or man lift requirements. While there are many IDMS applications on the market today, some of the most widely recognized names include UltraPIPE/PS AIM, PCMS, Meridium, ACET, Aware, and RBMI. Although companies use an IDMS as a tool to help manage their inspection programs more effectively, it is very common for problems to arise over time. Typical issues faced by most inspection teams are listed below. 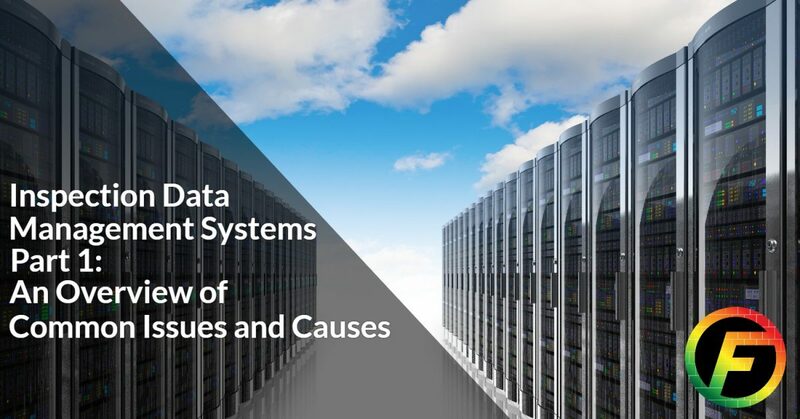 WHAT ARE THE TYPICAL CAUSES? The absence of well-defined and documented data management practices. Since inspection work processes often vary from company to company, IDMS developers have created software applications that are highly flexible. However, when users lack in-depth knowledge of the software’s functionality, this flexibility very often creates problems. Properly configuring the software to process inspection data is critical to accurately assessing equipment’s suitability for continued service and maintaining conformance with respective inspection codes. For example, one very widely used IDMS allows users to determine an equipment item’s remaining life by averaging the remaining life values calculated at each of its condition monitoring locations (CMLs). This necessarily means that some CMLs on the equipment will have retirement dates earlier than the retirement date of the equipment they are on. This issue may also appear within the inspection due dates since they are calculated using remaining life values. This type of data conflict is one that can create a lot of confusion during annual inspection planning and throughout the year as inspections are completed. Also, some companies rely on these averaged remaining life values to drive their integrity management decisions. Teams may believe that they have enough time to plan a replacement only to find that the equipment has failed during the planning period. As one can see, a poorly configured database can create conflicting inspection dates, retirement dates, and remaining life values potentially leading to overdue inspections and poorly informed integrity management plans. Most people would agree that a user’s ability to access certain functionality within a software application should always align with their competency level. However, far too often users are permitted full access to an IDMS with little or no oversight. Without truly understanding the impact their actions, these users can unintentionally create highly undesirable consequences. For example, providing full access to an entry level user might lead to them accidentally changing the inspection schedule for an entire plant when they only intended to update the schedule for a single piece of equipment. With the right level of controls and proper oversight, these types of large scale issues can be avoided. Quite often, companies will postpone IDMS training to help minimize inspection program expenses. In these cases, experienced personnel use on-the-job scenarios to share knowledge with junior team members. While this may be great for the short term, it is usually detrimental in the long run. Over time, the team’s collective knowledge decreases because less frequently-used skills are lost, and new team members are limited to informal peer-to-peer training which is often inaccurate. As you can see an IDMS software is a critical component to an inspection data management program. However, it is not enough to simply install the software and hire people to use it. The overarching inspection data management program must be maintained. Otherwise, inspection programs risk losing confidence in their data and a reducing their ability to manage mechanical integrity issues, which later forces them to spend a great deal of time and money fixing problems that could have been prevented. Therefore, it is highly recommended that inspection data management programs are assessed annually (including a detailed review of the IDMS itself) to ensure a high level of data quality and mechanical integrity are maintained. In part 2 of this series “Selecting the Right IDMS,” we will discuss the necessary considerations for selecting a new inspection data management system, including the selection process, scoring system, core functionality comparison, cybersecurity, remote access, and potential bolt-on tools. ©2017 Fortess Oil & Gas, LLC- Do not copy. All rights reserved.